After an unexpectedly brilliant win away at the then league leaders Luton, a looming crisis of confidence has been averted. However, this FA Cup tie in what could be an especially soulless Ricoh Arena against non-league opposition could quickly render McNulty’s header, Shipley’s free-kick and Nazon’s late coup de grace at Kenilworth Road into distant memories. After humbling exits in each of the past three years – Cambridge last year, Northampton the year before, and notably, Worcester the year before that – it should be abundantly clear that a tie against a supposedly lesser club in the FA Cup is far from straightforward. Mark Robins hasn’t treated the cup competitions seriously thus far this season but given the tradition of the FA Cup, as well as the revenue a good run would generate, it would be negligent for him to disregard this competition. Moreover, the squad has had a week’s rest heading into this game and there’s only a Checkatrade Trophy tie to play the following midweek. There are no excuses for not naming our strongest line-up here and treating it as we would a normal league game, albeit one that takes us a step closer to a potential trip to a big Premier League side. Just what our full-strength team at the moment is something of a debate, despite the performance against Luton. While the back six or seven players looks to be fairly settled, the make-up of our strongest attacking line-up is yet to be resolved. While there is the temptation for Robins to stick with a winning team, Maidenhead United are going to be vastly different opponents to Luton Town, and he may consider adjusting the personnel accordingly. 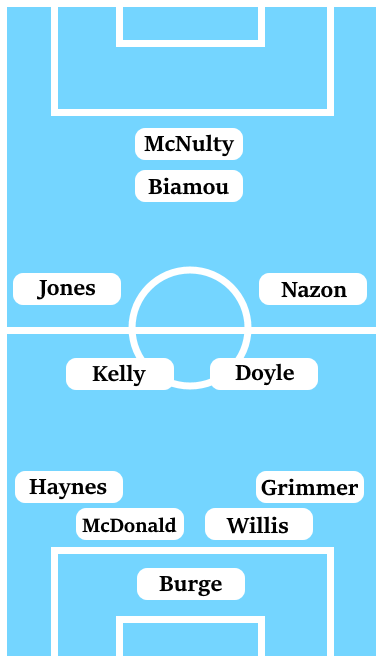 In an ideal world, this is probably a game to bring Ben Stevenson into the midfield in place of either Michael Doyle or Liam Kelly so that we have someone who can get their foot on the ball and orchestrate extended periods of possession more comfortably – that’s not going to happen though. I would expect Maxime Biamou to come in for Jordan Ponticelli in order to give the side a focal point to aim crosses into the box. A more dynamic wide option than Peter Vincenti is another must, but that could mean shunting Duckens Nazon or Marc McNulty onto the wing. We’ve never played Maidenhead United in a competitive fixture, not once. A town most famous for its Isambard Kingdom Brunel-built bridge and for being the constituency of the legendary UK Prime Minister Theresa May, its local football club are on the up. Promoted into the National League last season as National League South champions, Maidenhead stormed the opening month of the National League campaign thanks to the goals of Dave Tarpey. Tarpey, reportedly offered the chance to sign for us over the summer, scored a suspiciously impressive 44 goals in 41 appearances for Maidenhead in the National League South last season. After seven goals in six appearances at the start of the season, Tarpey took the decision to sign for Barnet, before picking up a serious injury in his second appearance for the club. Maidenhead manager and former West Ham legend Alan Devonshire is a wily operator in non-league, having turned part-time Braintree into a competitive outfit in the National League in his previous managerial posting. Devonshire has struggled at times to adjust his side to the loss of their goal machine, although midfielder Adrian Clifton has helped ease the burden with six goals from the centre of the park this season. Clifton looks the biggest danger-man among Maidenhead’s ranks, an attack-minded central player with skill and pace with the ball. 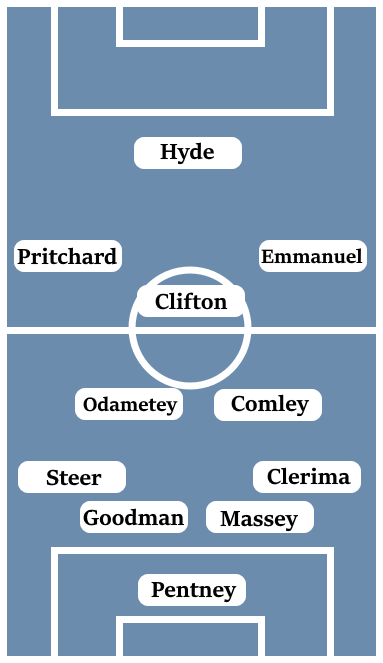 In a counter-attacking unit, Clifton is important in not only carrying the ball forward but in supplying an end product in and around the penalty area. Winger Harry Pritchard is another key element of Maidenhead’s counter-attacking play, while the pacey Moses Emmanuel out wide has been a reliable National League goalscorer in recent years. Even in the National League, Maidenhead look to defend deep and try and nick something either on the break or from set-pieces – with centre-backs Jake Goodman and Alan Massey someone we’ll need to make sure to mark. It was already apparent from the respective statures of the sides that this game would be about us looking to break-down a dogged and determined part-time side, but we are up against one with plenty of practice doing so this season. Not to be patronising towards Maidenhead, but this game, and certainly the stadium, will be their biggest in a long time. While they are a part-time side, they are only in the division below us so the gulf in quality between the two sides isn’t going to be as large as the respective histories of the clubs would suggest. This is a dangerous game for us if we show up expecting to stroll to victory. Even if we do show the right attitude, this game presents the challenge of breaking down an organised defence at the Ricoh, which we’ve struggled on multiple occasions already this season. If we can get an early goal to settle the nerves, this game should be more straightforward than I fear it will be. This is a game we should win, and I’m going to back us to get the job done with a 1-0 scoreline.